We watch the kids while you work out! $1.00 per child, ages 9 years and younger. Daytime childcare is offered Tuesday and Thursday mornings 8:00AM - 10:00AM. Evening Childcare is available Monday - Thursday, 6:00PM - 8:15PM. The Fitness Class Punch Card allows card holders the flexibility to attend any fitness class offered by the Byron Park District. One punch/swipe allows access to one fitness class. Persons wishing to attend a fitness class must purchase a punch card at the registration desk prior to attending classes. Fitness Class Punch Cards are refillable and do not expire. Annual Members receive half off the purchase price! NOTE: Fitness classes are open to anyone High School and older. Middle School youth can attend fitness classes with an adult, age 18 and older. Increase your speed, agility, and strength through a variety of training methods that will be an efficient and effective way to improve your cardiovascular system, lose weight and build muscle. Boot camp is a great new way to challenge your body and reach your goals in a fun, refreshing outdoor setting. This workout will be a combination of body weight exercises and high intensity cardio drills to build muscle and get your heart pumping. We will burn tons of calories and transform bodies while enjoying the Blackhawk Meadow Park. Kettlebell exercises are whole-body exercises requiring full body integration and core stabilization. There is no such thing as isolated muscle work in Kettlebell training. This class will build long lean muscles, improve strength and power in the upper body, core and lower body and increase coordination, joint mobility and overall endurance. Power Yoga will allow you to center yourself and get a great workout. This class is playful and energetic with fun music! It focuses on breath and allows all levels to be challenged in the same class. You will be able to clear your mind from the day and leave with a sense of empowerment. 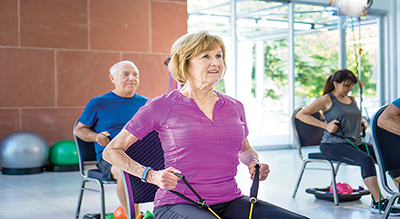 Increase muscle strength, range of movement, and improve activities for daily living. You'll have a chair for seated exercises and standing support. The instructor can modify the exercises for your fitness level. Find out if your one of the millions who have SilverSneakers. Start your day off right with Sunrise Yoga. This class is for all ability levels and will go through each pose so you can learn as we go! This class incorporates mindfulness awareness practices, gentle asana sequences, and breath based suns salutations to start your day full of positivity. Start your day off right, with TRX/Kettlebell Fusion! This is a circuit style, high-intensity class that will get you sweating! TRX Suspension Training uses bodyweight exercises to develop strength, balance, flexibility and core stability simultaneously. Kettlebell exercises are whole-body exercises requiring full body integration and core stabilization. Bring these two together and you'll get a calorie blasting workout that will challenge you from start to finish! Get energized and increase flexibility! Water workouts are a great way to increase your range of motion and are less stressful on joints and muscles. This aquatic class, suitable for all fitness levels and ages, combines cardio conditioning, muscle toning and stretching. Buoyancy belts and hand weights are incorporated into each workout. Swimming skills are not required. Classes are held at the Byron High School Swimming Pool. 7th and 8th grade boys and girls are invited to attend an orientation class on weight training in the PE Center Weight Room. Upon successful completion of the one-hour orientation class, participants will be allowed to purchase passes or pay the daily admission to use the weight room when accompanied by an adult, 18 years and older and out of high school. Each accompanying adult may supervise up to two (2) individuals at a time.The fee is $10. Contact Renita Krusey at 815-234-6492 or rkrusey@byronparks.org for additional dates. Upcoming Session Dates: Saturdays, April 20, May 18, June 15, July 20, and August 17 from 9:00AM - 10:00AM.